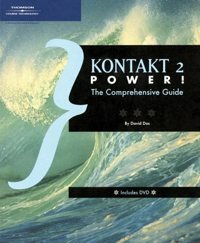 I’m proud to announce my first book has been published, Kontakt 2 Power, which is a comprehensive look at the Native Instruments Kontakt software sampler. I have a long history with Kontakt, having been involved in its conception before its original release in 2004, and beta-testing it and providing continuous input into its development ever since. It is also one of my most-used plug-ins as a composer and producer. This book was an outgrowth of my experience and work with the program. The central parts of the book are a few chapters which are devoted to click-by-click, step-by-step tutorials on building and tweaking Kontakt instruments. Samples are provided on the accompanying DVD, and I apply the “teach a man to fish and he will eat for a lifetime” maxim of touching on every major aspect of instrument building, tweaking, and usage once in the book, so that people who follow the tutorial chapters will end up with a very strong working knowledge of the program. Kontakt 2 Power is available for purchase through Amazon and other fine retailers. 2012 update: Though this book was written in 2005 when the current version of Kontakt was Kontakt 2, the publishers have not yet requested an updated version of this book even though the current version is Kontakt 5. Though Kontakt has evolved significantly between versions 2 and 5, the impact on the book’s content has been minimal. I would estimate that 90-95% of the book is still perfectly applicable to Kontakt 5. 2011 update: In related news, I’m now offering a starter set of six tutorial training videos for Kontakt. Some of the material is similar to what’s in Kontakt 2 Power, however, the book goes into much greater detail than the videos do. Click here for information about the training videos.